IU Southeast student Dale Brown takes in the dramatic vistas of Durlston County Park. The coast of Dorset is both scenic and geologically significant. (NEW ALBANY, Ind. )—This summer, a regional field geology class from IU Southeast traveled to the birthplace of modern paleontology: Dorset, England. It was here, in the picturesque seaside village of Lyme Regis, that the sharp-eyed fossil-hunting exploits of Mary Anning (1799-1847) transformed our understanding of time, and our place in the universe. Anning, who began collecting fossils at age 11, discovered the first complete and identified ichthyosaur, a marine dinosaur, as well as two plesiosaurs, among many others. Anning’s finds supported the idea—novel then—of extinction, and revealed a world of lost creatures that shattered traditional views of the age of Earth, and set the stage for the theory of evolution. Today the so-called “Jurassic Coast” is revered as a UNESCO natural World Heritage Site stretching for 95 miles and encompassing 185 million years of geologic history—including prehistoric seabeds, deserts, swamps, forests, and the creatures that lived in them. 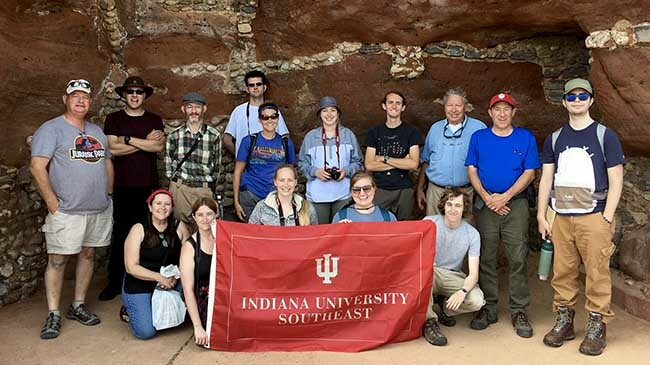 The IU Southeast group enrolled in G420 included enthusiastic students accompanied by Dr. Glenn Mason, professor of geosciences, Jennifer Lathem, lecturer in geosciences, and Gary Potter, adjunct lecturer in geosciences. Through classroom and field experience, the students got an immersion in the principles of stratigraphy, sedimentology and of course paleontology. 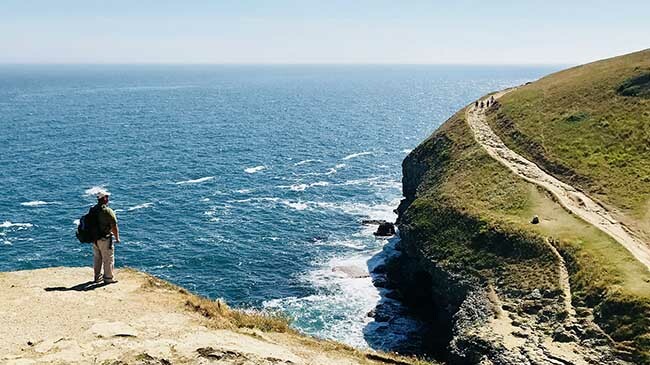 The nine-day trip took students to Lyme Regis, Chesil Beach, Sidmouth, Lulworth Cove, Durlston Head and other sites where they combined museum visits with guided fossil hunting. 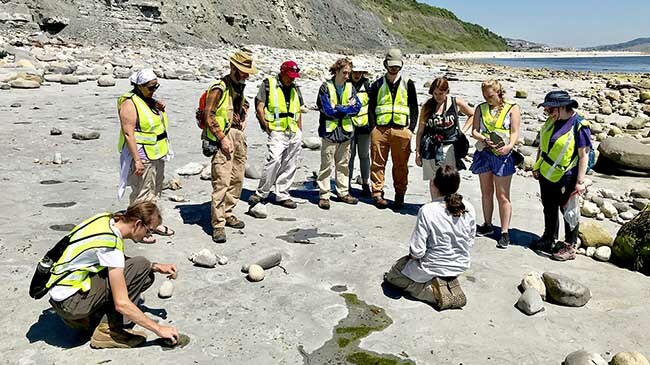 At Lyme Regis, Chris Andrew (seated), a learning officer for the Lyme Regis Museum, demonstrates to the IU Southeast students how “worm holes” are preserved in rocks. One particular highlight was a visit to the Etches Collection, a fossil museum in Kimmeridge launched by Steve Etches, a renowned fossil expert who, like Anning, is self-taught. The Etches Collection is a major educational resource, with over 2000 specimens collected over 30 years. Etches himself took the students into his lab and showed them some prized possessions that have never been put on display. The students also toured Stonehenge and historic Salisbury, a 1,000-year-old city, many of whose buildings were erected in in the Middle Ages. The IU Southeast geosciences group at the sandstone cliffs of Sidmouth. Photos courtesy of Jennifer Lathem. Homepage photo: The IU Southeast geosciences team at Durlston Head, on the Isle of Purbeck, Dorset.